The Baby Einstein Take Along Tunes Musical Toy Review – Great idea! As parents we are always on the lookout for products that will distract, entertain or educate the little ones in our lives. We do this by locating products that are colorful, musical or otherwise attention getting. Having a good product that will hold the attention of your child for more than a few seconds can be a virtual godsend to a busy Mom or Dad who simply wants to get that next load of laundry in the washer or dinner in the oven. We also expect that the items we buy will be the absolute safest in terms of components and will prove to be durable in the long run. An item that fits all that criteria is truly a wonderful product. 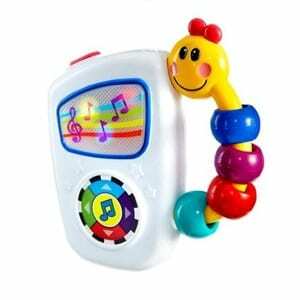 The Baby Einstein Take Along Tunes Musical Toy is a small easily grasped handheld device designed to play back exciting musical numbers while displaying a visual array of dancing lights across the front that accompanies the beat of the classical melodies. It has a volume control button to either make it louder or softer depending on your preference and has a carry handle so baby can take it along on car rides or visits to Grandma’s house. The company claims thatThe Baby Einstein Take Along Tunes Musical Toy promotes the love of music and enhances auditory development in addition to providing many hours of enjoyment to the child, with the beautiful music and colorful lights dancing over the display screen in time with the tunes. It is an award winning toy that has become a virtual bestseller across the continent. The one question to ask is why the Baby Einstein Take Along Tunes Musical Toy, when there are so many others that do virtually the same thing? Dancing lights set to music is really not a new concept and has been done many times over. What makes this one different from all the others that are in this category? The cost for theBaby Einstein Take Along Tunes Musical Toy is a very reasonable $7.39 at Amazon. As any parent of the last 5 to 10 years already knows the Baby Einstein collection of videos have spun off many toys and other licensed items designed for babies and small children. The music that this toy generates is very familiar to anybody who has watched a Baby Einstein video as it plays many of the songs that have been popularized by the videos. All the music is from the great composers such as Bach, Beethoven and Mozart. The colorful display is a great visual distraction and provides the baby with visual stimulation while the music is soothing and exciting at the same time. The unit has a volume control button allowing the parent to choose the appropriate sound level and an easily grasped carrying handle with caterpillar shaped sliding beads to further enhance the experience. From our own personal experience as parents, we fully agree that the love of music is a very important quality to instill in our children from a very early age. Also from experience, we have found that babies and small children (even older ones for that matter!) absolutely love the playfully arranged classical music that has made Baby Einstein such a worldwide success. The Baby Einstein Take Along Tunes Musical Toy is made from very durable plastic with no loose pieces to worry Mom and Dad and has a firm carrying handle to please baby by allowing them to carry it with them wherever they go. We suspect that after they play Baby Einstein Take Along Tunes Musical Toy the first time they WILL be carrying it with them. The lights are a wonderful addition and add to the experience with a sensational visual component that will only add to the enjoyment. We are going to give The Baby Einstein Take Along Tunes Musical Toy a Thumbs up rating. Out of 7,105 Amazon feedbacks it has received a 4.5 star rating. It is an excellent price and quality made and would make a great gift for those that have to shop for a new baby gift. While The Baby Einstein Take Along Tunes Musical Toy is certain to be a favorite of the little gift recipient we have talked about a lot of other great toys for the slightly older kids in the past that you may also want to check out such as the Hideaway Friends. What do you think? Does The Baby Einstein Take Along Tunes Musical Toy work or not?